I know, I know. “There’s too many bowls.” I hear this all the time. I, for one like the bowl games and will share some reasons to maybe change your mind enough to tune into the Camellia Bowl (Appalachian State Mountaineers vs Toledo Rockets). Toledo quarterback Logan Woodside led the FBS with 43 touchdown passes! How will he fare when he looks across the field at Phil Steele’s #10 ranked pass efficiency defense that only allowed 10 td’s while intercepting 19 passes? Toledo set a school record averaging 530 yards per game. While Appalachian State allowed non conference opponents to gain 420 yards per game, they did hold Tennessee to just 4.4 yards per play. Appalachian State runs the option offense that averages 247 (5.6) rush yards per game and Toledo allows 166 (4.7) rush yards per game. Toledo tight end Michael Roberts was named 1st Team Mid American Conference and the best tight end the Mountaineers faced this year was 3rd Team Sun Belt Buck Cowan from Idaho and he finished with 10 receptions for 118 yards and a touchdown. This is likely going to end up as a high scoring affair so if points is your thing, you will be entertained. These schools have met 10 times and Toledo leads 7-3 in the series. They last met in 2011, a 36-13 (+8) Toledo win. This is the second Boca Raton Bowl. Temple is bowling for the first time in four years and just the third time since 1979 (head coach Matt Rhule’s first). In their two most recent bowls, they’re 1-1 SU/ATS. This is Toledo’s second straight bowl (nine in 20 years). They defeated Arkansas State 63-44 (-3’) in last years GoDaddy bowl. Head Coach Matt Campbell took the Iowa State job, so this is offensive coordinator Jason Candle’s first ever gm as a head coach. Toledo entered the season a legit contender to win the MAC as they returned 13 starters including Alabama transfer quarterback Phillip Ely. After their first game was cancelled due to weather, they pulled off the shocking upset at Arkansas as a 21.5 point ‘dog en route to seven straight wins. Northern Illinois remained a thorn in their side (sixth straight loss to NIU), but they rebounded with back-to-back wins including on the road at eventual MAC champ Bowling Green (+7) and were in control of their own destiny, but lost their finale at home to Western Michigan. Toledo averages 463 yards per game, including 213 (5.1) rushing yards per game. Ely threw for 300 or more yards four times and the rushing attack is led by Kareem Hunt, who missed four games (suspended, hamstring). Temple was an experienced team entering the season as they had 19 returning starters. They also had over 20 seniors in the two deep and it showed as they opened the season with a statement win over Penn State and then went on the road to defeat Cincinnati and after starting the season 7-0, were ranked No. 21. They then lost a close game against Notre Dame and after blowing out Southern Methodist, were then blown out at South Florida. They kept their promising season alive by winning their final two regular season games, but then lost the AAC Championship game versus Houston. Their strength is the defense and they held five of their foes to season lows in yards and finished No. 14 in the FBS, allowing 80 yards per game less then their foes average. Neither team is happy with the way their regular season ended as Temple just missed a New Years Six bowl, while Toledo missed out on their conference championship game. Toledo has the edge on offense, but Temple edges on offense and special teams. It’s hard to say who will have the crowd edge as both schools are about 1,000 miles away from FAU Stadium. 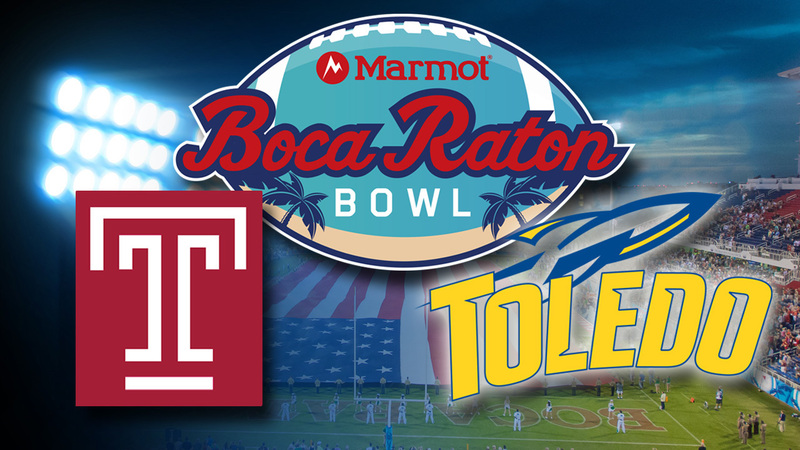 Toledo was plus 45.5 yards per game against bowl teams, while Temple was minus 2 yards per game. The Owls defense was also much better at home then away. The key match-up could be along the sidelines, where Temple will have their normal head coach, while the Rockets have a brand new one. -Toledo’s potent offense averages 456 yards/game, while Utah St is allowing just 325 yards/game. Something has to give there. Utah St, meanwhile, has a high-powered offense of their own, averaging 462 yards/game, while Toledo’s defense is horrid, allowing 464 yards/game. -Utah St has the best QB you may have never heard of in Chuckie Keeton. He’s thrown for over 3,000 yards, while completing over 67% of his passes, with 27 touchdowns vs just 9 interceptions. He is also a threat on the ground, rushing for over 500 yards, with another 7 touchdowns. He threw for over 300 yards in 3 of the last 4 games to end the season. Toledo will counter with Terrance Owens, who sat out the finale with an ankle injury, but had a solid season himself. Owens threw for over 2,600 yards, while rushing for nearly 400 despite not starting the season as the starter. -Toledo linebacker Dan Molls lead the country with an amazing 166 tackles on the season. Over the final 6 games he had no less than 13 tackles in a single game including 18 twice!! Utah St running back Kerwyn Williams will look to avoid Molls as he has rushed for over 1,000 yards and averaged 131 yards/game over the final 3 games of the season. -Three of the last six Idaho Potato Bowls have been decided by a single point! Utah St is a double-digit favorite in this one, and will have a definitive crowd edge. The Aggies won 6 in a row to close out the season, while the Rockets lost 2 of their last 3. No one point margin this year. Aggies win 45-27.